You’re headed to the sunny shorelines of Florida for a much-anticipated fly-fishing expedition, but first, you must stock up on a few essentials. Clothing: Light and breathable are the key words to remember here. You’ll be exposed to the sun most, or even all, of the day. Wear long-sleeve shirts and long pans (even sun gloves) if you burn easily. Stay away from cotton; go with light quick-drying synthetic materials that have a UPF factor of at least 30. If you are fishing from a boat, your shoes should have non-marking soles.. If you are wade fishing in the shallow on sandy bottom, you can get away with light booties or even sandals. If there’s likely to be oyster bars, make sure you have a thick-bottomed shoe to prevent your feet from getting cut up. Accessorize for conditions: A wide-brimmed hat with a dark underside will offer more sun protection and cut down on glare. Sunglasses should be polarized so you can see more clearly into the water. 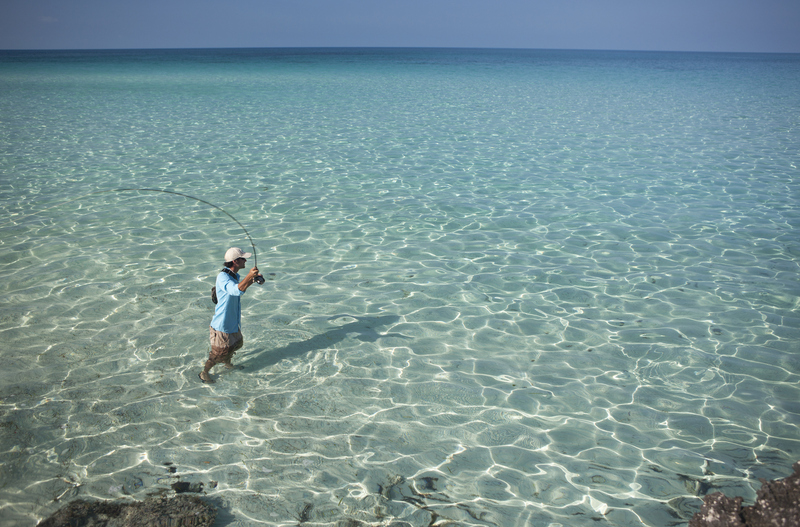 Sunscreen with a SPF of 30 or more is a must Insect repellant may be necessary if you are fishing tight to the shorelines and mangroves, rather than out in open water. It’s Florida, and the weather changes quick. Bring raingear in case you can’t outrun the storm. Basic gear: Bring the appropriate weight fly rod, reel, lines, leaders and flies for the species you are after. If you are going with a guide, check with him. If you’re going on your own, call a local shop for advice. You’ll use a lighter outfit for redfish and snook than you would for tarpon. Protect your gear for travel with rod tubes and a sturdy tackle bag. Pliers: for rebooking fish, crimping barbs, cutting heavy monofilament. Towel: for wiping fish slime off your hands. Duct tape or Super Glue: for emergency fixes or injuries. Preparation is key to having a successful trip. Do your research, call a tackle shop and listen to the locals. If you have questions about fishing the greater Tampa Bay area, call the Bill Jackson’s Fly Shack at 727-576-4169.